With Apex Learning Virtual School’s NCAA-approved online courses, student athletes can fulfill NCAA® initial eligibility requirements on a schedule that fits individual training and travel. Students can take individual courses for credit to be reflected on their local school transcript or attend our full-time, diploma-granting high school. High school athletes take our NCAA-approved courses to fulfill academic requirements. Review our list of online courses approved by the National Collegiate Athletic Association for initial eligibility. 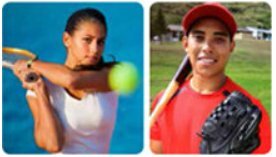 Online learning at Apex Learning Virtual School (ALVS) provides student athletes with the flexibility to start courses at any time of year. Students complete course work at the time and place that fits with each individual’s training and travel. The pace to complete a course can be accelerated as needed to meet deadlines. With the multimedia content of ALVS online courses, students stay engaged through interactive activities that incorporate audio, video, images, and animation. Our experienced online teachers and comprehensive curriculum ensure that each student’s learning experience lives up to the highest standards for academic excellence. Our results show our effectiveness: 85% of our students complete our courses with an 90% passing rate. In addition, students who complete our Advanced Placement® (AP®) online courses outpace the national average for passing the AP Exams. Apex Learning Virtual School is accredited by the Northwest Accreditation Commission (NWAC) an accreditation division of AdvancED, and our Advanced Placement courses have been approved through the official College Board audit process. Since 1999, more than 4,900 school districts have reviewed and selected Apex Learning as their trusted digital curriculum provider. For more information, visit the NCAA website. My son chose Apex Virtual School over all the other opportunities, including a great brick and mortar private high school and a well-known online high school.